It's been a busy few weeks but the Thanksgiving holiday certainly brings it all back to a reset. There was a ton of food, and quite a ton of reading. I've been enjoying 11/22/63 by Stephen King and am ready to move onto the third installment of George R.R. Martin's The Song of Ice and Fire series with A Storm of Swords. I'm in a reading peak of happiness. I also visited Prince Books in Norfolk, Virginia yesterday, and I cannot wait to post on this independent bookstore. While I wish we had an indie bookstore in Virginia Beach, I'm completely willing to drive the twenty-five minutes to this incredible shop. I can't wait to share with you! Question: How long do you have to drive to go to your favorite indie bookstore? 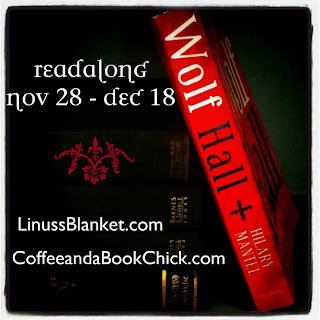 Also... as a reminder, the Wolf Hall Readalong commences today for reading (or before). Do. Not. Be. Scared. Let's read! The first time to post on Parts 1 & 2 will be next Sunday, December 4th. I'm excited to co-host this with Nicole from Linus's Blanket, who has a wonderful blog, and a blogger I've been chatting with on Twitter about our similar reading interests. Check out her site, it's fantastic! I'm also nervous about reading this book because I've heard a lot about it. Good and bad, but mostly all reviews stating that complete focus must be given when reading. Any distraction will result in leaving you lost and confused. Not that I drift a lot when I read a book, but we all know it can happen, and I don't want to miss a thing. We have fourteen participants with blogs joining the readalong (including me and Nicole), and a few more without blogs who will also be joining either through posting comments on the blog, or on our Facebook sites (Coffee and a Book Chick or on Linus's Blanket). This is pretty exciting and I can't wait to see everyone's contributions. As I've been tweeting out there, "The more the merrier," or... "There is safety in numbers!" I did receive an email asking if they could listen to the audiobook instead of reading it, and the answer is: Absolutely! Jump to the blog post by clicking here to read the introductory info and to post your intent to participate by either adding your blog link to the list, or by adding a comment if you don't have a blog. As you can see in that post, Nicole and I are completely flexible, there are no hard and fast rules at all, and it's so not a big deal on how you want to experience the reading, when you want to post, yada, yada. Let's just read this beast of a book together and commiserate on any questions or love we have for the story! My closest indie is about 15 miles away in the opposite direction of my regular commute. I don't go there as often as I like (probably a good thing for my wallet!) but it is one of my favorite places to visit. My indie is probably about 12 miles away, but it's worth it. I'm glad you found one near you! Good luck with Wolf Hall! I gave it my best effort but in the end I just couldn't finish it. I haven't even thought about reading Wolf Hall, but I'll be eager to learn your thoughts. I have 11/22/63, but will wait to start that one until...well, I'm not sure when! Oh gosh - I would love to join in! This book has been on my radar and I even have a copy on my TBR shelf, but alas, I cannot commit to it just yet :( When I do get to it, though, I know where to come. You'll leave a link for late-comers? And, yes, the bookstore thing? I would totally drive 25 minutes to go to a fabulous book indie bookstore. I so want to join this readalong, but am not sure I will have time! I can probably do it on audio though, so that makes me happy! Thanks for letting us know that that is an option! I am going to have to seriously consider joining! We don't have many independents in our area, and as far as I know, there is just one, and it's not my type of store. I would happily drive an hour or two to find a decent one, and may actually have to think about investigating that. Have a happy Sunday, Natalie! Enjoy your day! Good luck with Wolf Hall. I haven't read it yet, but I have heard mostly good things. To answer your question, we don't really have any indie bookstores. We have a regional chain and a national chain and a couple of small used bookstores. Otherwise, we have to drive two hours to Phoenix to the closest large independent. There's nothing quite like a good indie store that you can enjoy! I live south of San Francisco so it is short driver or shorter train ride to my favorites! I wish there were more down here where I live but my budget is probably better off with that not being the case!